Regarded by many as Hungary's greatest twentieth-century poet, Atilla József was born in Budapest in 1905 and died, after apparently throwing himself under a train, in December of 1937. 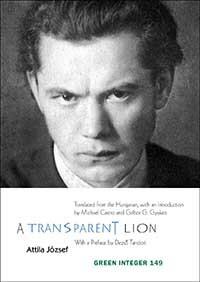 József lived a difficult life marked by severe poverty, loneliness, and depression, paralleling the conditions of his native Hungary during an uncertain and turbulent period of the 20th century between the wars. Writing in intense emotional tones that swung between despair and hope, József invigorated old poetic forms with a new freedom, orchestrating his poems with fresh rhythmic patterns influenced by folk music's rhythms as well as their metrics. But József was also influenced by Dadaist and other modernist ideas sweeping Europe, finding a voice that would synthesize the older cultural forms of Hungary with the new experiments of his time. New Yorker Michael Castro is a poet and translator who translated the anthology Swimming the Ground: Contemporary Hungarian Poetry and works by Attila Balogh. He has published six books of his own poetry. Gábor C. Gyukics was born in Budapest, and divides his time between the U.S. and Hungary. He co-edited Swimming the Ground and has published three of his own books of poetry. He received the Fust Milan translator's prize from the Hungarian Academy of Science in 1999.